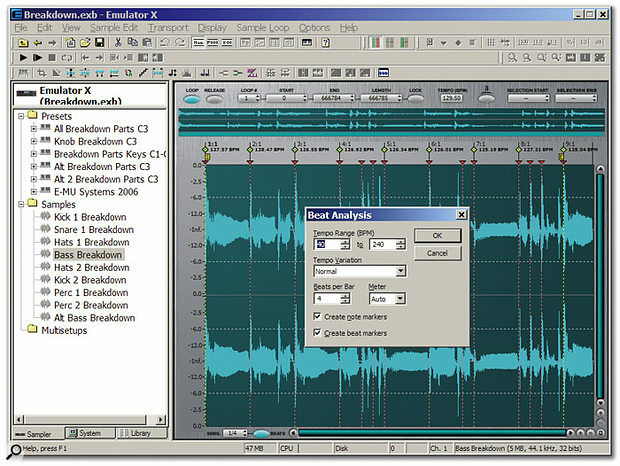 Chopping audio files into beats and bars takes only a few seconds with the easy-to-use Beat Analysis function. Emu's Emulator X software sampler caused a huge stir when it was originally released in early 2004. Running either as a stand-alone program or as a VST Instrument, it shipped with the Emu's 1820M audio interface, acclaimed for its breakthrough audio quality, and featured an incredibly comprehensive synthesis engine including more than 50 Z-Plane filters previously only found in Emu's hardware samplers, extensive 'patch cord' routing options, multi-wave LFOs, an integrated waveform editor and a range of DSP tools for sample manipulation. Later that year saw the release of the cheaper Proteus X, which omitted the user-sampling functions but was otherwise very similar, at an even lower price. Now, Emulator X2 and Proteus X2 take things to a new level of sophistication. 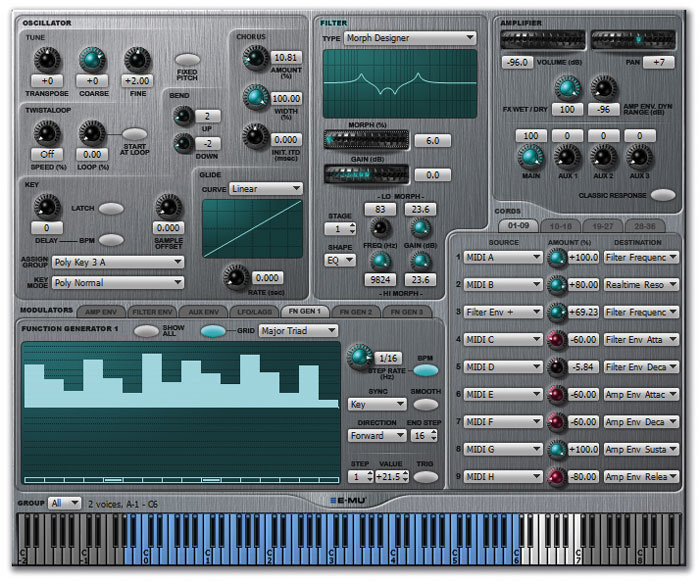 Emulator X2 can be bought in three versions: as an upgrade bundled with a single new Xperience library CD-ROM for existing Emulator X or Proteus X owners; as an add-on with the complete 3GB four-CD sample library to any of Emu's current audio interfaces or controller keyboards; or as a full retail product with the 3GB library and the Xmidi 2X2 USB MIDI interface that effectively acts as a dongle. You can read more about the library CD-ROMs in the box later in this article. The add-on and retail versions are a big departure for Emu, since previously you could only use the Emulator X software if you had one of Emu's PCI soundcards; X2 will also be of interest to those who want a capable soft sampler but who already have a perfectly good audio interface. Out of interest I left my existing Emulator X installed to see what happened, and was very pleased to see that the Emulator X2 setup detected this and offered to uninstall it prior to replacing it with the newer version, so there were no conflicts. X2 has a slightly more restrained appearance, with darker 'brushed aluminium' panels and fewer shiny metal highlights, and I felt this looked more sophisticated and was easier to read. There are also some fundamental changes to the sampling engine, with the stand-alone Emulator X2 now supporting 64 instead of the previous 32 MIDI channels; the VST Instrument version remains limited to 16 MIDI channels, although of course you can load multiple instances in your DAW. There's also a new External Edit option so you can work on samples in your favourite editor, while the Voices & Zones page has been heavily reorganised to accommodate controls for the new features. For many musicians, the highlight of X2 's new features will be Twistaloop. This can chop audio grooves into their constituent beats, create new loops and regions from them, play them back at any tempo without changing pitch (including locking to external song tempos) using audio time compression/expansion, and even jump between multiple loops in real time using MIDI controllers. At the heart of Twistaloop is a new beat-detection engine. You just choose the sample you want to work on, click on the Beat Analysis function of the Sample Edit window, and a small dialogue appears offering various tempo and timing choices. The default settings will be fine with most material, but it does help to restrict the engine to the approximate tempo range of your loop, and to indicate how many beats there are in each bar. The further options can help if your loop has sudden changes of tempo rather than gently wandering ones, or is a short sample with a rigid tempo. Once your audio has been chopped into beats and you've selected multiple loops from them you can play different ones back in real time at different tempos using the Twistaloop and Loop (n) controls.Once analysed, your loop appears in the Sample window with its bars and beats highlighted by markers, and adjusting the Sensitivity setting lets you determine how many 'notes' there will be — a low sensitivity will mark the loop as several longer sections, for instance, while higher settings let you chop the loop as far as individual hi-hat hits of a complex drum groove. Sensitivity can either be set as a percentage below peak level, or switched to Beat intervals ranging from eight bars to 16th notes. Triplets and duplets are also catered for, and if necessary you can fine-tune both beat and note markers by clicking and dragging. Now comes the fun bit: with Snap To Marker enabled, you can quickly and easily highlight any section of your audio defined by the note markers and declare it a loop by using the Make Loop From Selection command. You can do this as many times as you like with different audio sections from this one sample, and when you've finished, move to the preset's Voice Processing page and access these multiple loop selections for playback. Using the new 'Loop (n)' rotary control you can choose which of your selections to play, and depending on the setting of the associated Start At Loop button, you can either play all of the sample until your looped section begins and then starts to loop, or just play that loop section. You can also route MIDI velocity, aftertouch, or other external MIDI controllers to the Loop Select function, so you can change it in real time during a performance or automate it from your sequencer. You can even use the Loop functions with multisampled voices, where the various samples used may contain different numbers of loops. In this scenario the control changes to 'Loop (%)' and, for example, a sample with two loops would change over at the 50 percent setting while another with three would switch at 33 percent and 66 percent settings. 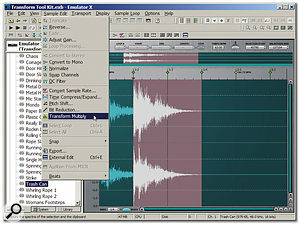 Another new feature lets you take the various looped sections of a single sample and map them to different keys in the Voices and Zones window — this would, for instance, let you create a multisampled instrument from a single long recording containing all its separate notes, or play back different sections of a drum loop together using different keys. There are three new Multi-function Generators so you can perfect 64-step sequences, arpeggiators and complex envelopes, while the Morph Designer Filter lets you create your own filter responses with up to six stages.With the rotary Twistaloop control of the Voice Processing page set to 'Off' your loop will play back at its original tempo, but once on, you can set it anywhere between half and double speed, while the pitch stays constant. There are some artifacts at slow speeds, but they are not worse than with many other such functions, and I doubt that groove-manglers will mind them at all anyway. Each preset can have its Twistaloop loops locked to the global master tempo, while the Twistaloop Override settings for the entire preset bank let you globally turn this on or off or abide by the individual preset settings. When Off the various drum loops in a particular preset may all originate at different tempos, but once analysed by the beat-detection engine the same selection of loops will now sync perfectly together, and you can change the tempo in real time to follow your song. The well-written PDF manual provides copious examples for all the new features to explain all the subtleties, but I found it a doddle to import samples, chop them up into sections, and then assemble them into performance presets. The Xperience CD-ROM also contains plenty of well-designed examples to show off these new features, including one-note jam sessions where you can pick and choose which combinations of instruments play using the mod wheel: improvising jazz drummers, velocity-switched wah-wah guitar riffs, presets that have different loop lengths in each stereo channel for ever-evolving riffs, and monster presets containing dozens of synchronised riffs that you can drop in and out at will. The upgraded X2 engine provides three new Multi-function Generators for each voice, and I suspect most musicians will drool over their capabilities. Each provides between one and 64 steps, and you get at them on the new FN Gen tabs on the Voice processing page. Operation is almost self-explanatory — there's a graphic window showing your programmed steps, and you can zoom into shorter sequences. The easiest way to enter new sequences is to draw them in with the mouse, but you can switch in a handy selection of vertical 'grids' to restrict values to semitones, octaves, major and minor triads or scales over a ±32 semitone range. For finer control you can instead select individual steps and input the value using inc/dec buttons or text entry, and there's also a 'Smooth' function that glides between each step. 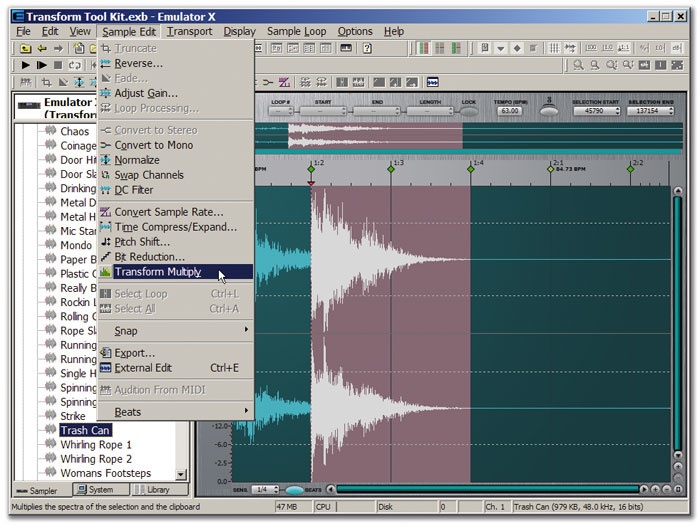 Convolution made easy — you can apply any section of one audio file to any section of another, enabling complex new sounds to be built up in stages.The step rate can be specified over a very wide frequency range from one cycle every 12.5 seconds to 18 per second, or switched to BPM, where the options change to a huge selection of tempo rates, from eight whole notes to 32nd notes (including triplet settings), derived from the master tempo setting. You can sync the sequence so that each new key-press starts a new one at the beginning, so each new note starts at a random step in the sequence, or let the first note played start the sequence and then all subsequent notes follow the same pattern in exact channel sync. Apart from the usual choices of forward, reverse, forward/back and one-shot sequence directions, there are also random and Brownian (random but always one step from the previous position) options. There's also an optional Gate signal for each step so you can trigger other events at any point during the sequence, and to further spice up the proceedings, various Multi-function Generator parameters appear as modulation destinations, enabling you to change their rate, direction and length, or even re-trigger them from the beginning, via other parameters or external MIDI controllers, all in real time. Luxury indeed! The most obvious application for these Multi-function Generators is to design 64-step sequencers or arpeggiators by patching them to note pitch, but as we've come to expect from Emu, there's a vast array of other options, such as creating complex multi-step envelopes for the filter or amplifier sections, letting the timing of one Multi-function Generator be controlled from another for multi-speed sequences, and so on. Talking of filters, Emu have already generously provided more filter responses (55) than the average user can shake a stick at, but for the true explorers of synthesis the new Morph Filter Designer lets you at the bits that have previously been denied to all but Emu sound designers. Accessed via the normal filter menu, the Morph Designer lets you combine anywhere between one and six filter sections in series, each with a choice of low-pass, high-pass, or EQ (peak or dip) responses. For each stage you enable (and watch out for your CPU overhead, because of course they all require more processing) you get Frequency and Q controls for both the lowest and highest setting adjusted by the Morph wheel, so you can move smoothly between these extreme settings and hear the effect of the filter sections in combination. Given that the Morph value is also a modulation destination and can therefore be controlled by MIDI velocity, envelope level, LFO, or of course the new Multi-function Generators, this provides you with huge creative potential that's streets ahead of most other sampling products, whether software or hardware. 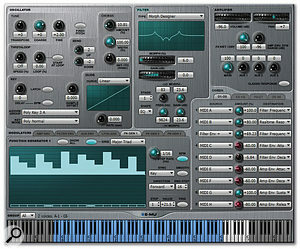 Emulator X2 is bundled with a four-CD-ROM sample library almost identical to that shipped with the original Emulator X, containing the excellent 1000 X-Producer presets from Emu's Proteus 2000 hardware synth module, the Hip-hop Producer pack, Saint Thomas strings, a 20MB GM soundset, the Studio Grand piano, and the Beat Shop 1 set of kits, loops and grooves, plus a new CD-ROM labelled Twistaloop Xperience, which showcases all the new X2 features. Vintage X Pro Synthesizers: three volumes totalling 11 CDs, containing 8GB of classic analogue and digital synths and keyboards. Mo' Phatt X, Planet Earth X, Virtuoso X: complete sound sets from the original hardware modules. Beat Garden X: cutting-edge techno and dance instruments plus acoustic instruments and percussion. Protean Drums X: drums and percussion from acoustic kits to R&B, rock, jazz and more. Techno Synth Construction Yard X: dance, ambient and techno sounds from Rob Papen. Street Kits: urban dance drum sound library from Eddie Bazil of Samplecraze. Beat Shop 2: samples and grooves. Modern Symphonic Orchestra: five-DVD set containing 10GB of string, brass, woodwind and percussion. Old World Instruments: strings, winds and percussion from around the world. Transform Multiply is a new tool added to the already comprehensive roster of Sample Edit Tools (apart from the usual trim, fade, normalise, change gain, reverse and channel swap options, this already includes Bit Reduction, Time Compression, Pitch-shift and Sample Rate Convert). The name may be unfamiliar, but musicians who have used convolution reverb plug-ins will recognise the results straight away — Transform Multiply performs exactly the same tricks, but this time as an off-line rather than real-time process, which means the results don't require any further CPU when played back. To use Transform Multiply, you select the desired sample in the sample bank, highlight any portion of it to act as the 'treatment', and then use the Copy function (or Ctrl-C keyboard shortcut) to place it on the Windows clipboard. 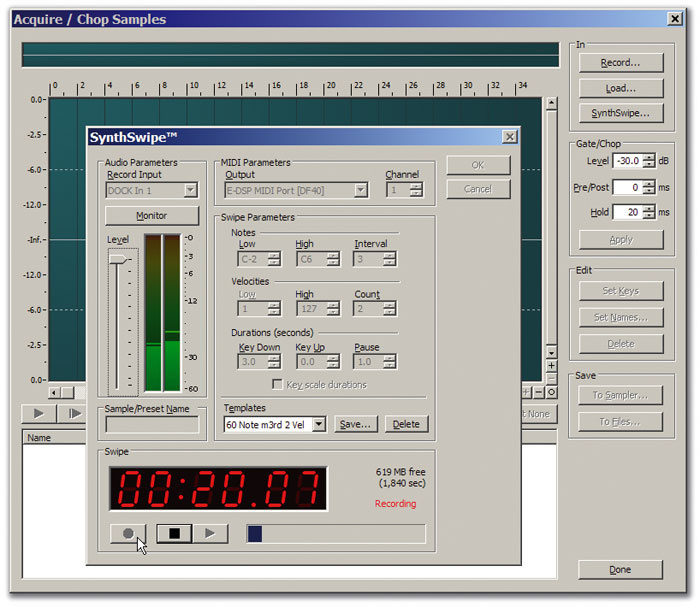 Then you select the sample that you want to treat, select any or all of it for treatment, and finally choose the Transform Multiply tool from the Sample Edit menu and choose an intensity from the pop-up dialogue window — 0 percent is totally dry, intermediate values are more suitable for reverb-style treatments, while 100 percent provides the most extreme totally 'wet' effect. As always with convolution plug-ins, you don't have to restrict yourself to reverb treatments: applying shorter impulses derived from microphones or acoustic instruments can add their 'flavour' to existing sounds, while using speech will result in vocoded-like results, and repeated sounds will give exotic echo units. You might think Transform Multiply is a poor relation to the real-time effects of a convolution reverb, but you'd be wrong. 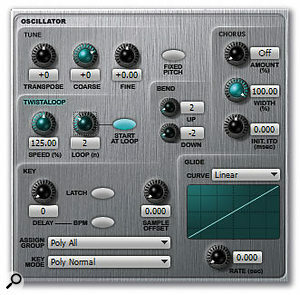 In conjunction with the new Twistaloop beat-detection engine you can quickly extract rhythmic sections from the source sample and convolve these with any section of the destination sample — within a few seconds I was applying different convolution treatments to individual beats in a loop, resulting in totally new sounds. This is yet another tool that yields some fascinating and totally unique results if you put in some effort, and once again goes way beyond what's on offer in other samplers. And so to Synth Swipe. As more and more of us move from hardware to software synths but don't want to leave our old sounds behind, it becomes increasingly important to have a way of capturing them in an automated manner. John Walden recently reviewed the stand-alone Skylife Sample Robot utility in SOS March 2006, but at £169, this is probably too expensive for most people wanting to transfer the contents of a few synths to their hard drives. A much cheaper Essentials version has since been released, but Emu make this process far more elegant by incorporating it as an extra feature into Emulator X2 (but not Proteus X2, since this lacks user-sampling functions). Synth Swipe helps you transfer the sounds of existing hardware synths across to Emulator X automatically.Synth Swipe is accessed from X2 's Acquire/Chop Samples page, and when you click on its Synth Swipe button a new dialogue window is launched. The Audio Parameters section lets you choose which input your synth is connected to, while you can monitor its sounds and adjust its level using the associated controls. Meanwhile, you connect the synth's MIDI input to the MIDI output and channel you've selected in Synth Swipe's MIDI parameters section. Next comes the tedious bit — deciding on the lowest/highest notes to command your synth to play, how many notes in between, how many velocity values to be sent for each of these notes, and the note on and off durations. Now you just click on the Record button, and the audio output for each chosen note in turn will be captured at however many velocity settings you've chosen. 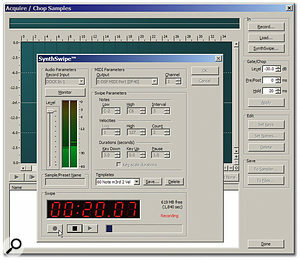 Once your note samples have been recorded, you return to the Acquire/Chop Samples page where they are automatically chopped into note lengths, and can also be auto-normalised and auto-looped en masse using a selection of algorithms with crossfade options, and finally turned into an Emulator X2 preset. Then you can apply any of the normal engine treatments such as further filtering, LFOs and so on. Conversely, you could also capture the output of Emulator X itself (or another soft synth), in order to render complex CPU-intensive presets into versions that are less stressful to your processor. It took me a few minutes to tweak the recording levels to avoid clipping and explore the various options before my first Synth Swipe, but having done one I found it incredibly easy — this is an extremely powerful addition to the Emulator X feature set! Some of you may have noticed my enthusiasm for the Emulator X2 seeping through this review. I'd seen demos of the new features at trade shows and been suitably impressed, but it was still far more fun using them all than I'd expected, and occasionally jaw-dropping in the creative department. There are now quite a few soft samplers, but Emulator X has always had a good reputation for its audio quality, and the X2 version stands out for its incredible versatility, although CPU overhead can rocket if you avail yourselves of too many of the features in a single preset. Overall, Emulator X2 is a major upgrade to an already impressive soft sampler, and as a £60 upgrade for existing Emulator X users should be snapped up immediately, as it offers a stunning range of new features. If you've already got another item of Emu hardware mentioned in the list of the beginning of this review, £190 seems a bargain for such a comprehensive soft sampler and 3GB bundled library. I also suspect that severing the requirement for an Emu soundcard, as the full retail version does, will now tempt others who already own a perfectly good audio interface but are looking for a soft sampler. Anyone into loops will love Twistaloop's ability to chop multiple audio files into segments and sync them all together in real time with varying tempo. Sound designers will drool over the new Multi-function Generators, built-in convolution, and Morph Filter Designer. Emulator X2 no longer requires an Emu PCI soundcard to function. Synth Swipe is a great help to those moving from hardware synths to software sampling. Such a comprehensive sampling engine can easily consume lots of CPU unless you're careful. The feature set may seem overwhelming to new users. Emu's Emulator X was already one of the most musical soft samplers available for the PC musician, but the X2 version takes it to new heights of creativity! Emulator X2 retail version including Xmidi 2X2 MIDI interface £219.99; X2 upgrade for existing Emulator/Proteus X owners £60; X2 add-on for owners of other Emu products £189; Proteus X2 add-on for owners of other Emu products £120. Prices include VAT. Emu +353 1 433 3201. Emu Europe +353 1 433 3205.